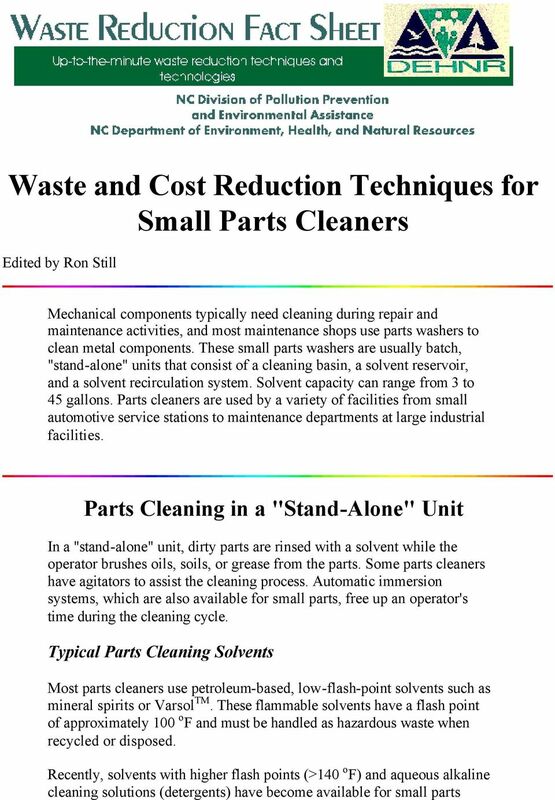 Download "Waste and Cost Reduction Techniques for Small Parts Cleaners"
2 washers. If they do not become contaminated to the extent that they meet the definition of a hazardous waste, both these higher flash point cleaners have the potential to eliminate hazardous waste disposal costs associated with spent solvents. 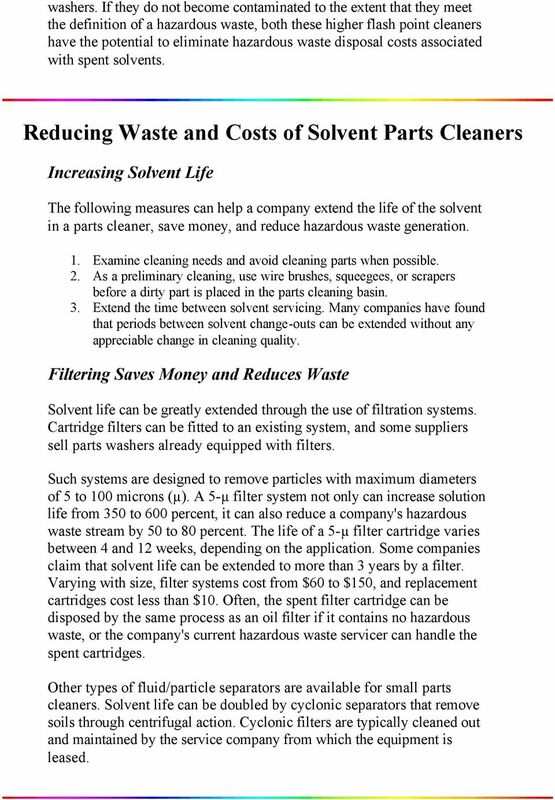 Reducing Waste and Costs of Solvent Parts Cleaners Increasing Solvent Life The following measures can help a company extend the life of the solvent in a parts cleaner, save money, and reduce hazardous waste generation. 1. Examine cleaning needs and avoid cleaning parts when possible. 2. As a preliminary cleaning, use wire brushes, squeegees, or scrapers before a dirty part is placed in the parts cleaning basin. 3. Extend the time between solvent servicing. Many companies have found that periods between solvent change-outs can be extended without any appreciable change in cleaning quality. Filtering Saves Money and Reduces Waste Solvent life can be greatly extended through the use of filtration systems. Cartridge filters can be fitted to an existing system, and some suppliers sell parts washers already equipped with filters. Such systems are designed to remove particles with maximum diameters of 5 to 100 microns (µ). A 5-µ filter system not only can increase solution life from 350 to 600 percent, it can also reduce a company's hazardous waste stream by 50 to 80 percent. The life of a 5-µ filter cartridge varies between 4 and 12 weeks, depending on the application. Some companies claim that solvent life can be extended to more than 3 years by a filter. Varying with size, filter systems cost from $60 to $150, and replacement cartridges cost less than $10. Often, the spent filter cartridge can be disposed by the same process as an oil filter if it contains no hazardous waste, or the company's current hazardous waste servicer can handle the spent cartridges. Other types of fluid/particle separators are available for small parts cleaners. Solvent life can be doubled by cyclonic separators that remove soils through centrifugal action. Cyclonic filters are typically cleaned out and maintained by the service company from which the equipment is leased. 4 chemicals used in the maintenance area. For example, certain brake cleaners contain 1,1,1-Trichloroethane, an F-listed solvent. If this brake cleaner is used in the part washers, the entire batch of solvent would be considered hazardous, according to the mixture rule, and must be managed as a hazardous waste. However, many alternative brake cleaners are available that do not contain F-listed solvents and provide good cleaning. 2. Find replacements for any F-listed solvents used in the maintenance area. 3. Eliminate the use of these solvents to avoid any possibility of contamination. 4. Instruct employees not to pour or spill any liquids into the washer that could lower the flash point of the entire solution. 5. Review the type of material being cleaned. For example, if lead soldered parts are being cleaned, the solvents may fail a TCLP toxicity test for lead and, thus, be considered hazardous waste. 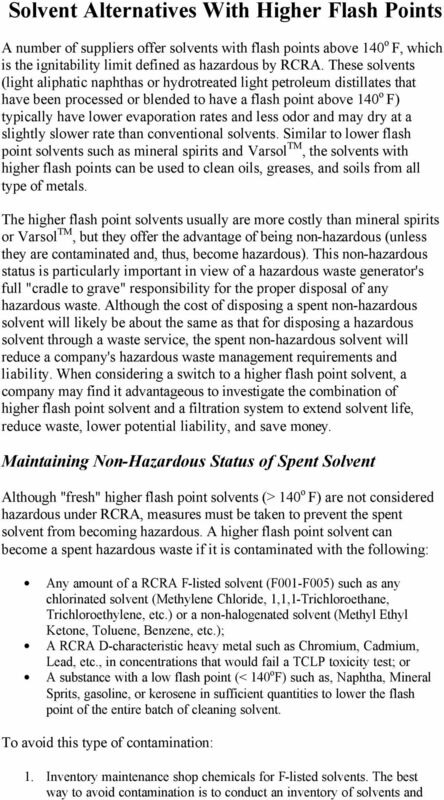 Non-Hazardous Disposal Options Even if a spent high-flash-point solvent is characterized as non-hazardous, the solvent must be handled through a solvent servicer for recycling, fuel blending, or incineration. Options may also be available for on-site fuel blending. The North Carolina Hazardous Waste Section at (919) can provide more information on hazardous waste management. 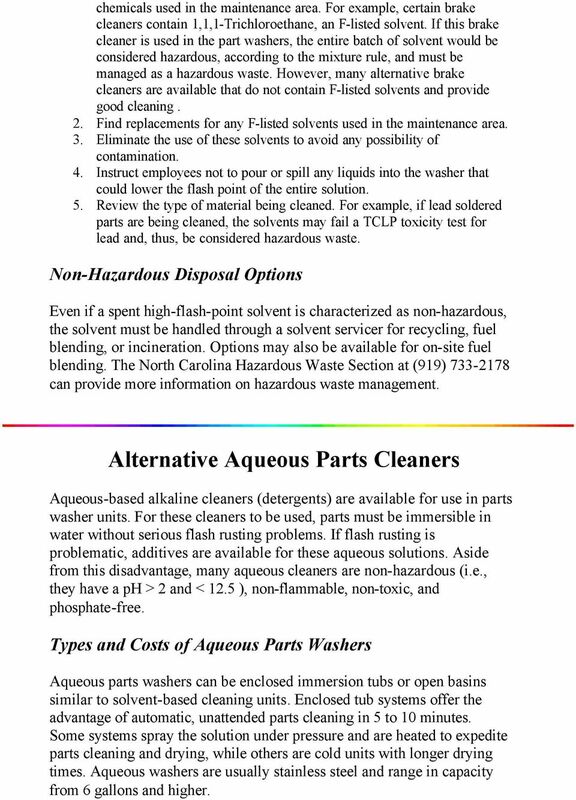 Alternative Aqueous Parts Cleaners Aqueous-based alkaline cleaners (detergents) are available for use in parts washer units. For these cleaners to be used, parts must be immersible in water without serious flash rusting problems. If flash rusting is problematic, additives are available for these aqueous solutions. Aside from this disadvantage, many aqueous cleaners are non-hazardous (i.e., they have a ph > 2 and < 12.5 ), non-flammable, non-toxic, and phosphate-free. Types and Costs of Aqueous Parts Washers Aqueous parts washers can be enclosed immersion tubs or open basins similar to solvent-based cleaning units. Enclosed tub systems offer the advantage of automatic, unattended parts cleaning in 5 to 10 minutes. Some systems spray the solution under pressure and are heated to expedite parts cleaning and drying, while others are cold units with longer drying times. Aqueous washers are usually stainless steel and range in capacity from 6 gallons and higher. 5 To extend the life of an aqueous solution, oil skimming can be performed either manually or by a unit installed to remove oil. Solution life varies from 3 weeks for heavy use to 4 months for lighter applications. A typical batch of solution for a 30-gallon unit requires 4 pounds of powdered cleaner and will cost between $28 and $44. As with solvent-based systems, filter systems can extend bath life. Aqueous filter systems can, in some instances, be rinsed several times before a new cartridge must be purchased. Typical operating costs for a 30-gallon aqueous parts washer range between $4 to $6 per day as opposed to $5 to $6 per day for solvent systems without filtration. Disposal of Aqueous Solutions Potential disposal options for spent aqueous-based solvents include (1) discharge to a local sewer system, (2) pre- treatment of the aqueous solution and then discharge, or (3) off-site disposal by a waste servicer. A company should check with the local wastewater pretreatment coordinator before discharging any spent aqueous cleaner. Some vendors of small aqueous cleaners also offer off-site disposal services. The same rules discussed above for maintaining the non-hazardous status of spent solvents apply for preventing the contamination of aqueous cleaners by hazardous substances. 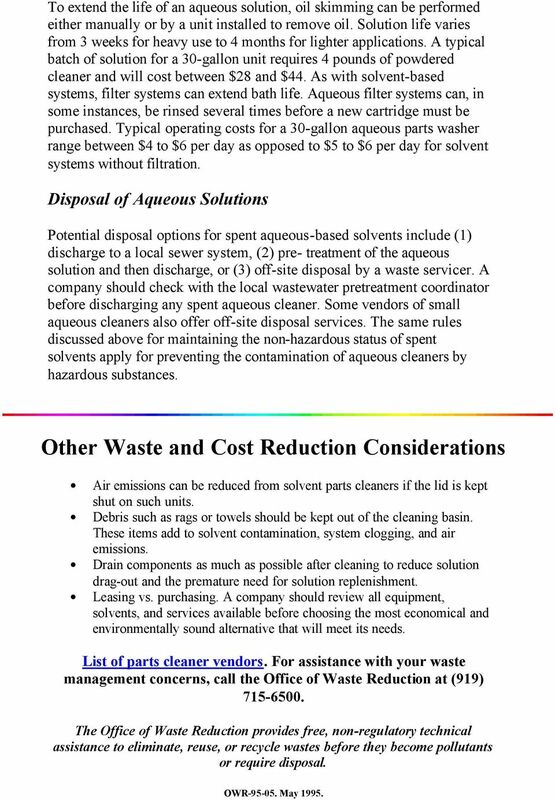 Other Waste and Cost Reduction Considerations Air emissions can be reduced from solvent parts cleaners if the lid is kept shut on such units. Debris such as rags or towels should be kept out of the cleaning basin. These items add to solvent contamination, system clogging, and air emissions. Drain components as much as possible after cleaning to reduce solution drag-out and the premature need for solution replenishment. Leasing vs. purchasing. A company should review all equipment, solvents, and services available before choosing the most economical and environmentally sound alternative that will meet its needs. List of parts cleaner vendors. For assistance with your waste management concerns, call the Office of Waste Reduction at (919) The Office of Waste Reduction provides free, non-regulatory technical assistance to eliminate, reuse, or recycle wastes before they become pollutants or require disposal. OWR May 1995. Pollution Prevention forauto Maintenance and Repair Shops Kansas State University Pollution Prevention Institute This publication was written by Sherry Davis. Design and cover designed by Rich Gardner. Photos courtesy of Elmcrest Country Club, Cedar Rapids. Successful Pollution Prevention Strategies in a Zinc Die-Casting Plant An article from the Journal of Environmental Regulation, about successful pollution prevention strategies in a Zinc Die-Casting Plant. Montana Pollution Prevention Program. that are not indicated. POLLUTION PREVENTION PRACTICES FOR AUTOMOTIVE FACILITIES Purpose Auto and heavy equipment shops can generate hazardous wastes that can be hazardous and damaging to the environment if not managed appropriately. 1. Introduction THE TEXAS A&M UNIVERSITY SYSTEM HEALTH SCIENCE CENTER CHAPTER XI HAZARDOUS WASTE DISPOSAL Hazardous waste disposal is governed by the EPA and the TCEQ through State and Federal regulations. INDUSTRIAL COATINGS RA260 WATER EMULSIFIABLE RUST PREVENTATIVE PRODUCT DESCRIPTION is water emulsifiable rust preventative oil, which provides outstanding corrosion protection for all phosphate metals. Section 1 Chemical Product and Company Identification Product Name : Power Hydrol HLP 32. Chemical Family : Refined Paraffinic Petroleum Distillate. Apar Industries Limited Material Safety Data Sheet. Section 1 Chemical Product and Company Identification Product Name : Power Hydrol HLP 32. Chemical Family : Refined Paraffinic Petroleum Distillate. Automotive Repair Shops In the following, you will be given a case study which was performed by a consulting firm in the late eighties regarding the waste generated by automotive repair shops in California. Hint: air quality A preventive maintenance program should be in place to prevent spills and leaks and to maintain the plant at maximum efficiency. Without hazardous chemicals, you don't have employee exposure.